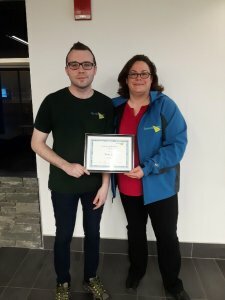 Employee of the Month - April 2018 Blake V.
Blake was welcomed to the ServiceMaster Clean of St. John's Team in 2016. Blake is dependable, efficient, and punctual. His willingness to repeatedly take on extra work has been impressive and greatly appreciated. Blake is a great worker and gets along very well with his co-workers. We were very pleased that Blake was nominated by his co-workers as Employee of the Month, and are honoured to add him to our list of exemplary employees. Congratulations Blake! !